The 2008 alimony reform in Germany considerably reduced post-marital and caregiver alimony. 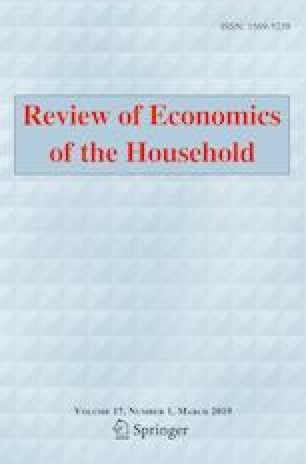 We analyze how individuals adapted to these changed rulings in terms of labor supply, the intra-household allocation of leisure, and marital stability. We use the German Socio-Economic Panel (SOEP) and conduct a difference-in-difference analysis to investigate couples’ behavioral responses to the reform. In general, the results do not confirm theoretical expectations from labor supply and household bargaining models. In particular, we do not find evidence that women increase their labor supply as a result of the negative expected income effect. Neither do our results reveal that leisure is shifted from women to men as a response to the changed bargaining positions. We find some evidence that married couples are more likely to separate after the reform, but this effect vanishes once unobserved heterogeneity at the couple level is controlled for. The authors are grateful to the editors, Shoshana Grossbard and Tansel Yilmazer, two anonymous reviewers, Thomas Bauer, Christina Gathmann, and participants at the BeNa internal workshop 2015, the 9th RGS Doctoral Conference, the 2016 Annual Conference of the Verein für Socialpolitik and the 28th Annual Conference of the European Association of Labour Economists for valuable comments and suggestions. Bertelsmann Stiftung (2009). Das neue Unterhaltsrecht—Mehr Fairness nach der Trennung? : Dokumentation einer Umfrage. http://www.bertelsmann-stiftung.de/fileadmin/files/BSt/Presse/imported/downloads/xcms_bst_dms_28424_28425_2.pdf. Accessed 14 Jan 2015. Chiappori, P.-A., Iyigun, M., & Weiss, Y. (2009). Divorce Laws, Remarriage and Spousal Welfare. Unpublished Working Paper. https://www.researchgate.net/profile/Pierre_Chiappori/publication/264858176_Divorce_Laws_Remarriage_and_Spousal_Welfare/links/544503410cf2534c76602da1.pdf. Accessed 7 Apr 2019. Statistisches Bundesamt (2016). Statistik der rechtskräftigen Beschlüsse in Eheauflösungssachen (Scheidungsstatistik) und Statistik der Aufhebung von Lebenspartnerschaften: Fachserie 1 Reihe 1.4. https://www.destatis.de/DE/Publikationen/Thematisch/Bevoelkerung/Bevoelkerungsbewegung/Scheidungsstatistik2010140167004.pdf?__blob=publicationFile. Accessed 1 Jun 2018. Statistisches Bundesamt (2017). Bevölkerung und Erwerbstätigkeit: Fachserie 1 Reihe 3, Haushalte und Familien, Ergebnisse des Mikrozensus. https://www.destatis.de/DE/Publikationen/Thematisch/Bevoelkerung/HaushalteMikrozensus/HaushalteFamilien2010300167004.pdf?__blob=publicationFile. Accessed 1 Jun 2018.